On the face of it, the fast-approaching spring 2019 home selling season should be better for prospective home buyers than the brutally competitive, ultra-low-housing-inventory spring market of 2018. 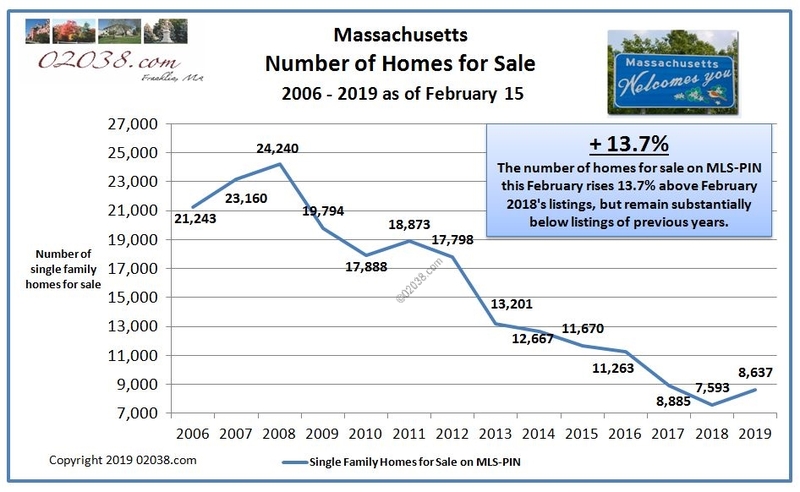 That’s because there are significantly more single-family homes for sale on the Massachusetts MLS now than there were this time last year. There are currently nearly fourteen percent more single-family listings for sale on MLS-PIN than there were last February. Those extra listings translate into a larger supply of housing for sale across all of the Bay State and in each of the sub-markets shown in the chart below. 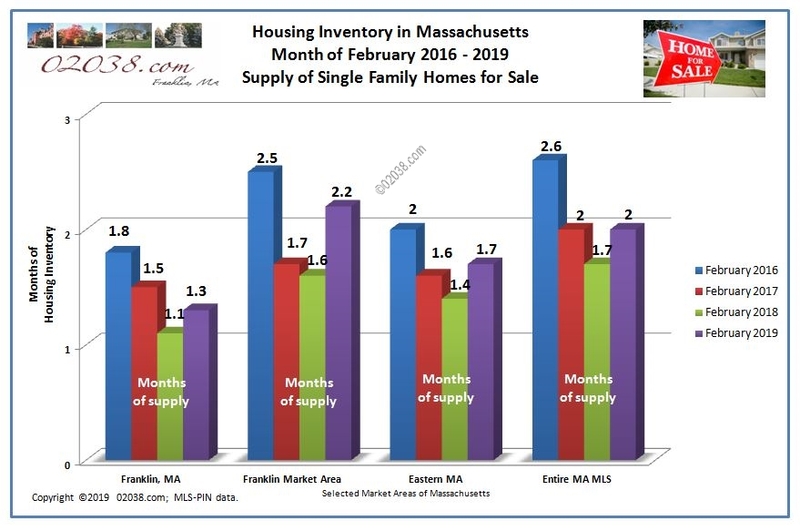 However, with just a two month supply of available homes in Massachusetts and even less inventory in Eastern MA, housing supplies still remain painfully low. Despite the increased number of homes for sale on the MLS now, prospective home buyers this spring may very likely still face a daunting challenge finding decent homes at affordable prices. The problem confronting buyers in the Bay State today is not simply an inadequate inventory of homes for sale. While housing supplies in MA have been tightening over the last few years, Massachusetts home prices have at the same time been hitting all-time highs. The resulting toxic combination of low housing supplies and high home prices has skewed the mix of homes on the market very much towards the high end of the price spectrum. While there are single-family homes for sale in every city and town in the Commonwealth, many of these homes carry very high price tags. There’s very little to be had in most communities in the more affordable price ranges! The following chart of the current inventory of single-family homes in Franklin, MA illustrates this bedeviling effect. The chart depicts the supply of single-family homes for sale in Franklin, MA by price bracket. The chart shows a stark reality. While there are relatively plenty of homes for sale in Franklin priced above $600,000 (see the twenty-four months of supply in the $700,000s), single-family homes in town priced below $600,000 are in extremely short supply. 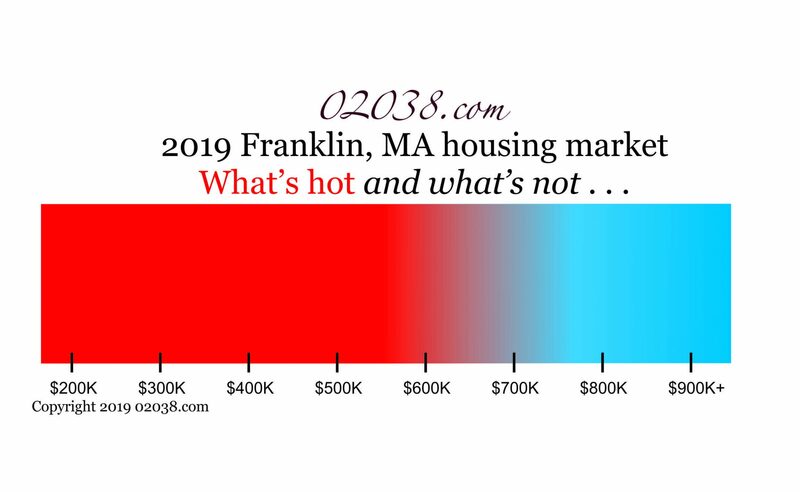 It’s easy to see why single-family homes under $600,000 in Franklin, Massachusetts are “hot.” Below $300,000, there are currently no single-family homes for sale in Franklin – none! And for homes priced between $300,000 and $599,999, there are very slim pickings, most of these price brackets having only a fractional month of supply. 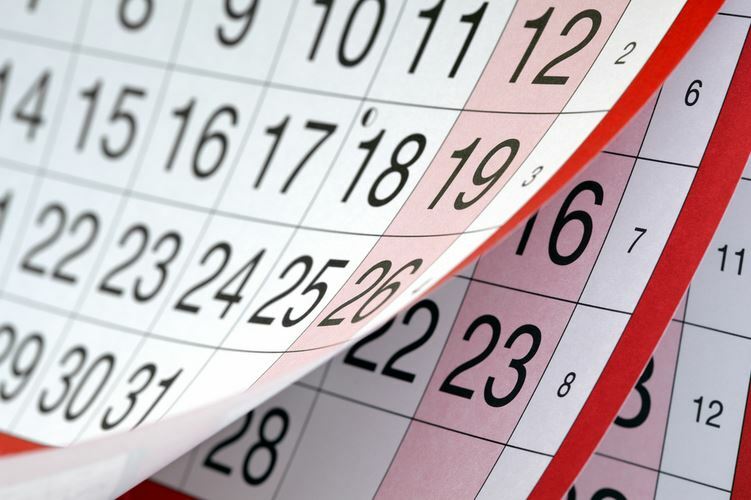 Only for homes in the $400,000s is there more than one month of inventory in Franklin. And the $400,000 bracket tops out at a very paltry one and a half months of offerings. 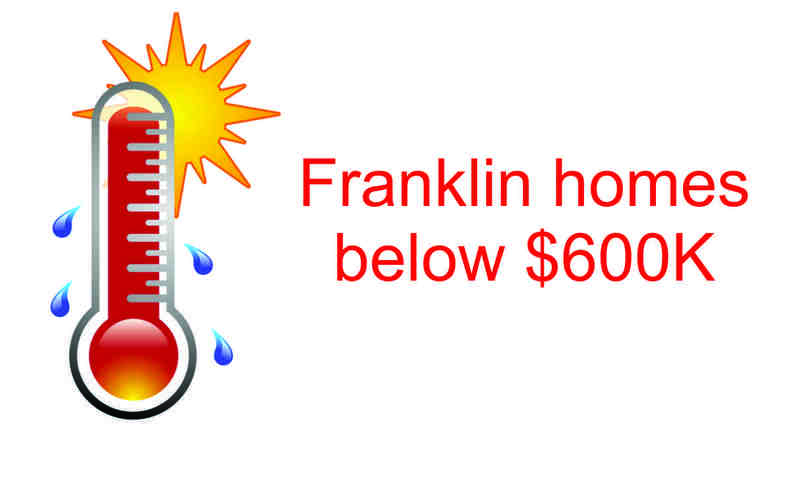 This does not mean any house priced under $600,000 in Franklin will automatically sell quickly and with no issues. Proper pricing remains very important, despite the low inventory of affordable properties in town. The asking price for any home must reflect the key factors that determine market value: age, condition, and location. Even in a red-hot price bracket, a home seller CAN overprice and find tough going getting offers. There have been quite a number of Franklin listings, both this year and in 2018, priced in the $300,000s, $400,00s and $500,000s that sat unsold for weeks and even months due to simple, basic overpricing. In Franklin, as asking prices head towards $700,000, the intensity of buyer demand generally wanes. Fast sales of homes asking above $700,000 in Franklin can and do happen. But for the most part, homes priced above $700,000 in Franklin, MA can find themselves fighting the headwinds of competition from similarly priced listings in other cities and towns in the broader region around Franklin. 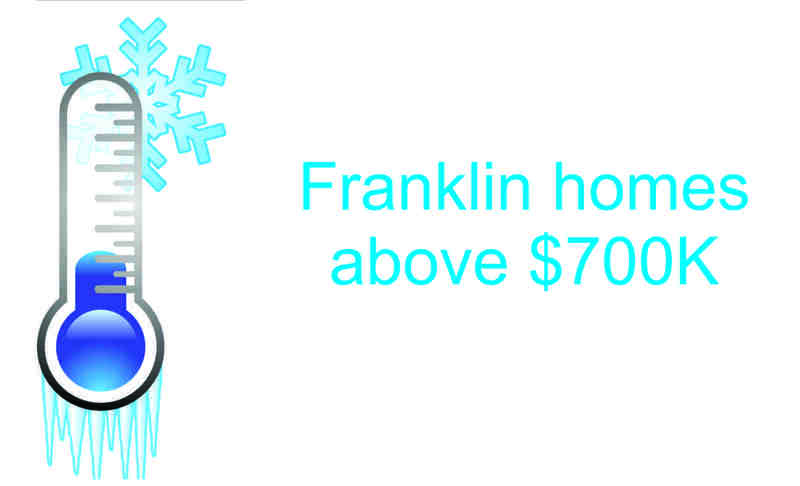 Franklin offers many benefits that make it a top choice for home buyers in the greater I-495 area. Franklin was recently named the second safest city in the entire United States. It enjoys a surprisingly broad array of cultural resources that are hard to duplicate in other area communities. Franklin has a beautiful new high school and is home to a top-performing charter school. Add in a commuter-friendly location, an attractive housing stock with low property taxes, plentiful shopping and services, superb recreational resources, and commuter rail service to Boston, and you have a winner! 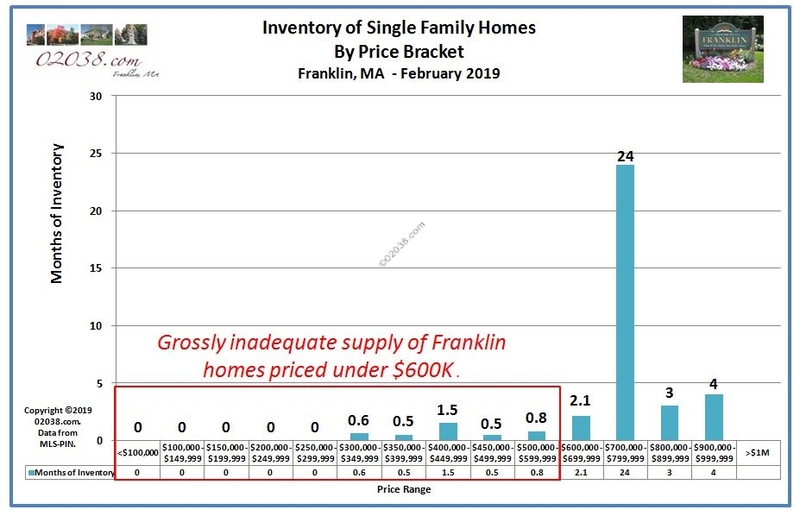 And yet, home buyers looking for a single-family home priced $700,000 or higher in the greater I-495 area will find good choices in many other communities besides Franklin. Towns such as Wrentham, Medway, Norfolk, Holliston and Hopkinton are all quality places in which to live and carry substantial inventory of homes at and above $700,000. All the extra competition can mean a longer time on the market for higher priced homes in Franklin! There’s a lot to be said for physically getting inside homes for sale and looking around carefully, week in and week out, month after month. That’s how an astute agent who approaches the real estate business as a profession can build local knowledge that no real estate algorithm or website can replicate. 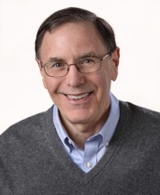 Over years of diligently touring literally hundreds, and even thousands of homes, a dedicated real estate practitioner can develop highly valuable expertise in determining why some properties will quickly, while others will not. The priceless knowledge of how a local market functions is what a true professional can share with you as your agent to your lasting benefit, whether you are a home seller or a home buyer. It’s that character and ability that you should seek when you select a real estate agent. I’m always ready to apply for the job of representing you – all you have to do is reach out to me!